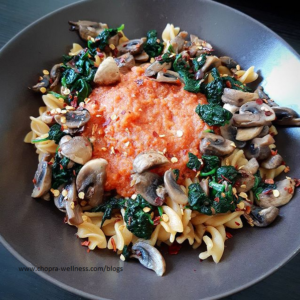 Here’s a Healthy Pasta Alternative: No it’s not made with Zoodles! Who loves pasta? Well, I certainly do. These days I try to make my pasta from scratch (yes, sometimes I get my hands dirty with the dough too). This one here is store bought. It’s made of chickpea flour with only three ingredients on the back. The rest you see is all homemade goodness. I want to talk about processed sauces and dressings: Many of the processed and packaged sauces and dressings are extremely calorific and unhealthy, due to the high sodium content, sugars, preservatives and certain oils that you just don’t need for your body (definitely not in those bizarre amounts). These lentil and legume-based pasta options work so well for me (may not work for everyone). I stopped making wholewheat or durum wheat pasta, or even white flour pasta because it wrecked my body and made me feel lazy, tired, hungry (craving salt and sugar ALL THE TIME), and cranky too. TRUST ME FOOD CHANGES YOUR BODY AND YOUR MIND (and my clients would vouch for it too). Especially no compromise on natural wholesome products to make my sauces. So how did I go about making this yummy goodness? Let’s start with the tomato sauce? : it is so easy to make and can be stored for at least 15 days. Blended the mix together, and cooked in cooked until smooth and soft. Then blended. It tastes too good and it’s way better than store bought sauce. Sauteed Vegetables: 5 minutes and this yumminess is prepared. Sautee for 5 minutes in a teaspoon of olive oil. Once cooked, mix it all together and EAT! Give it a go folks! Just be mindful of your portion??. And let me know if you have doubts or concerns or just want to let me know if you tried it. ← Body Image? Are we really perceiving ourselves differently?